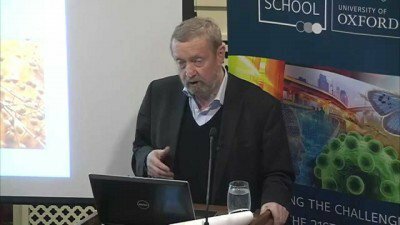 Sir John Beddington is Senior Advisor and Professor of Natural Resources Management at the Oxford Martin School in Oxford, UK. He also belongs to the Central Team of the Oxford Martin Commission for Future Generations (OMC) and is former Chief Scientific Adviser to the British government and Head of the Government Office for Science. Bringing together international leaders from government, business and civil society, the OMC calls for a radical shake-up in politics and business to embed long-term thinking and provide practical recommendations for action to create a more resilient, inclusive and sustainable future. There is a movement in Europe which is just against any genetically-modified plant used for food [and] that is so naïve. There’s no doubt in the developing world, plants can be modified to be resistant to drought or insect pests and that is going to be very, very important moving into the future. He also claimed that GM could boost yields, which would be needed to feed a growing world population, and claimed there is approximately two billion people experiencing malnutrition and these people either lack sufficient levels of nutrients needed for proper development or are eating too much poor-quality food. With 25 per cent of children dying in the first few years of life, he said that children were being robbed of their social and economic potential. In an era of so-called ‘anti-science’, he argued it was more important than ever that scientist ensured their relevancy within society. In the recent article, Pro-GMO Scientists Blinded by Technology and Wedded to Technology, I addressed the issues raised by Beddington and challenged his erroneous views about GM. Now campaigner Dr Rosemary Mason has written Beddington an open letter that urges him to acknowledge the adverse impacts of the modern system of food and agriculture. She presents him with a detailed account about the massive adverse effects of agrochemicals on health and the environment and highlights the need to address the various concerns that scientists, environmentalists and others from various groups and disciplines have about GM crops and food. Mason discusses scientific fraud, which has allowed the likes of glyphosate on to the market and to remain there, and highlights conflicts of interest and media manipulation by the agritech/agrochemicals industry. She also notes how legislators and policy makers first and foremost set out to protect the interests of the industry. As with her previous documents, in her 17-page (8,800-word) letter to Beddington (Open Letter to Sir John Beddington Professor of Natural Resources Management Oxford Martin Commission), Mason cites official reports and statistics as well as peer-reviewed papers, and she has done her homework when it comes to pinpointing the links between agencies, individuals and funding to demonstrate how fraud, corruption, conflicts of interest and policy decisions serve the interests of the agritech/agrochemicals sector at the expense of the public and the environment. Mason begins her letter by referring to Dr Henk Tennekes, an independent toxicologist, who predicted environmental catastrophe from the use of the systemic neonicotinoid insecticides. 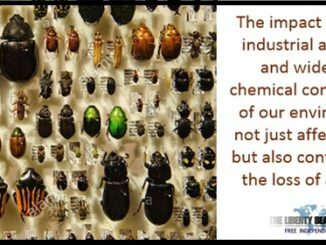 He said that these chemicals act on the brains of insects (and humans) in a virtually irreversible and time-dependent manner. Various independent studies have shown that the collapse of bee colonies, the loss of other invertebrates and bird declines in Europe are associated with chronic low levels of these chemicals. Bayer and Syngenta are fighting the partial neonicotinoid ban, however, and the EU authorities have granted many exemptions, including those requested by industry. These insecticides are still on the market and their usage is even increasing. In south Wales, where she resides, Mason highlights the catastrophic effects as a result of the excessive and improper use (despite EU regulations/recommendation) of the biocide glyphosate, not least that substance’s links to the massive spikes in numerous serious diseases and illnesses in the region. She discusses how the European authorities committed scientific fraud in concluding glyphosate was not carcinogenic and reveals that one third of the members of the BFR Commission on Pesticides and their Residues were directly employed by the chemical industry, while others had questionable links. The commission was responsible for evaluating glyphosate. Mason also notes that much of the German government’s recent evaluation of glyphosate – favourably compared to the IARC’s evaluation by the agrochemical industry – was not actually written by scientists working for the German Federal Institute for Risk Assessment (BfR) but rather by the European Glyphosate Task Force, a consortium of agrochemical firms. According to Mason, conflicts of interest also undermined the Joint FAO/WHO Meeting on Pesticides Residues (JMPR). She discusses individuals and institutions connected with JMPR who/which received substantial amounts of industry money. From cataracts and dementia to autism obesity and cancer, Mason notes the disturbing link between the increasing use of glyphosate and other biocides and spiraling rates of illness. She goes on to show how the dominant cultural narrative about health promotion and disease deflects attention from the role of agrochemicals and how strategically placed figures with links to the industry help fuel this process. Sir John, I note that you have been on Monsanto business in Australia promoting GM. There is no point in preaching to Australia. It has been in the hands of the agrochemical industry since 2002 and has an industry-funded Science Media Centre like the UK (as has Japan and New Zealand.) In fact, the Australian Pesticides and Veterinary Medicines Authority (APVMA) didn’t want to bother to reassess glyphosate, but their citizens insisted. The closing date for comments was 30 December 2016. The three areas that are in the hands of the pesticides industry are also the areas with the most obesity problems: the UK, the US and Australia. You and Lord Smith, at that time Chairman of the Environment Agency, were warned in 2011. In February 6th 2011, we wrote to you and to Lord Chris Smith. We said: “The agrochemical industry has used the environment as a huge, private experimental laboratory”. Mason then proceeds to document a series of conflicts of interest, noting links between Cancer Research UK and Syngenta, BASF, Bayer CropScience, Dow AgroSciences, DuPont, FMC Corp, Monsanto and Sumitomo. She adds that Syngenta is a member of the European Glyphosate Task Force (GTF). Britain and the GTF claim that glyphosate does not cause cancer and disagree with World Health Organisation’s International Agency for Research on Cancer (IARC) which has declared glyphosate as a 2A carcinogen (probably carcinogenic in humans). Syngenta, AstraZeneca and the UK government have a mutually beneficial relationship with each other at the expense of the British people One corporation promotes cancer; the other corporation tries to cure it. In 2010, Michael Pragnell was appointed as Chairman of Cancer Research UK, and by 2011 CRUK was donating money (£450 million/year) to the Government’s Strategy for UK Life Sciences, and AstraZeneca (Syngenta’s parent company) was providing twenty-two compounds to academic research in the UK to develop medicines. AstraZeneca manufactures six different anti-cancer drugs mainly aimed at breast and prostate cancer. Glyphosate and other pesticides earn billions for the pharmaceutical companies with the sales of statins, anti-hypertensives, antidepressants, diabetic medication, anti-cancer drugs, weight -reducing drugs, vaccines and drugs to treat dementia etc. Mason notes the links between diet and disease and says scientific evidence is accumulating that a diet-based cure is much more effective than current medical treatments which are largely ineffectual, expensive, and plagued by side effects. She adds that these important facts about the power of nutrition are not widely known, however. That is because they simultaneously challenge the food industry, the pharmaceutical industry and the medical profession. Powerful agritech/agribusiness corporations are intent on rolling out a globalised system of chemically-laden food production that adversely impacts human health and diets and leads to micronutrient deficient soils and crops. These corporations seek to eradicate indigenous farming systems centred on smallholder agriculture that can – if the recommendations of various high-level reports are acted on – feed the world healthily and sustainably. And that includes the two billion who experience malnutrition that Beddington refers to: unfortunately, as Rosemary Mason and the information contained the embedded links in this and the next paragraph indicate, the current corporate-led GMO/chemical-intensive ‘Green Revolution’ model leads to exactly the opposite. If there is to be a radical “shake-up in politics and business to embed long-term thinking and provide practical recommendations for action to create a more resilient, inclusive and sustainable future” then challenging the power structures that undermine the goal of healthy, equitable food provision and production has to be integral to that “shake-up”. Of course, Rosemary Mason is not a lone voice in all of this. The Pesticide Action Network just last week released a statement saying that Europeans are consuming dozens of pesticides on a daily basis and that there has been 12 years of inaction and failure in the EU’s attempts to reduce pesticide levels in food. In 2014, Corporate Europe Observatory concluded that the European Commission had been a captive but willing servant of a corporate agenda (an agenda partly fuelled by the agrochemicals sector). And writing in The Guardian in 2015, Arthur Nelson noted that as many as 31 pesticides with a value running into billions of pounds could have been banned in the EU because of potential health risks, if a blocked EU paper on hormone-mimicking chemicals had been acted upon. Nelson wrote that Commission sources said that the paper was buried by top EU officials under pressure from big chemical firms. But that’s the whole point, isn’t it? As Mason and others constantly imply, a system not run for the public good can never serve the public good. 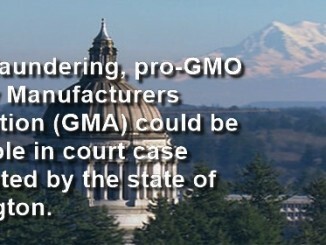 Money-laundering, pro-GMO Grocery Manufacturers Association (GMA) could be held liable in court case prosecuted by the state of Washington. Thank you Colin Todhunter and thank you Dr Rosemary Mason. Anxious to see if there wil be a response from John Beddington, he definitely is in denial and need of this information that he and his cronies have conveniently ignored.